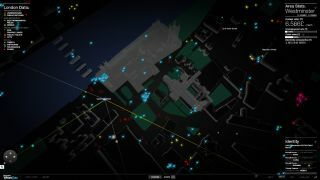 Watch Dogs might still look like a terrifying future concept of an all-connected city, but the technology and data isn't so far off - as the game's latest campaign is here to show us. We Are Data, created by Ubisoft, is the first website to gather publicly available data about London, Paris and Berlin and pool them in a 3D map, letting you snoop on a wealth of geolocalised information on what people are up to. All the data displayed is presented in real time. You can see the social media activity of people, CCTV camera whereabouts, and even follow the movement of trains. Of course, all of the data is that which has been authorised to be used by the sources. There's also a truckload of data about the city itself, including crime stats, energy consumption and network data. But who watches the Watch Dogs? TechRadar got early access to the website and spent a lot of time scanning around London, feeling the immense power of having all this data at our fingertips. The site uses several different technologies including node.js and Socket.IO for collecting navigation data. Not only is the experience on PC and Mac via a browser, but a dedicated smartphone and tablet app will also be available. In Watch Dogs you play in a fictional version of Chicago city that's run by a Central Operating System, which similarly collects city data to solve problems. You can go check out the website, which is now live over here.